Jonathan Bean er CMO i Mynewsdesk. 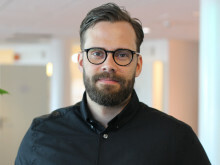 Der er ansvarlig for det internasjonale teamet som jobber med design, produktmarkedsføring, demand generation samt marked og kommunikasjon. Under hans ledelse har markedsavdelingen de siste årene lykkes med å bygge opp en solid maskin for leadgenerering, samtidig som man har blitt belønnet med flere kommunikasjonspriser. Utover arbeidet i Mynewsdesk sitter han i styret for LRF Media, og holder stadig foredrag. 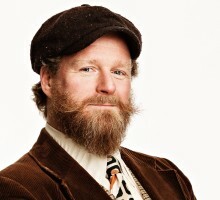 Hans ekspertise er innen digital transformasjon, innovasjon og forandring innen medier, kommunikasjon og teknologi. 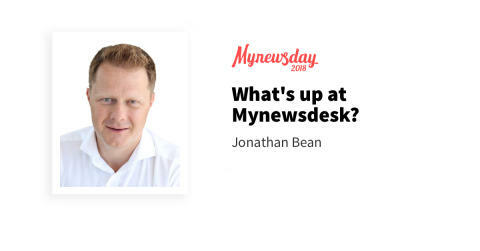 På Mynewsday skal Jonathan holde foredraget “What’s up at Mynewsdesk?”, og siden det vil holdes på engelsk, har vi tatt intervjuet på samme språk. This year you will talk about what is going on at Mynewsdesk, can you give us a hint on what that is? ­– Well we have been working hard at Mynewsdesk this year on our data strategy and how we can provide value to our customers based on the data we have. Daily we serve over 100,000 communicators who in turn are communicating to millions of contacts through all channels and generating over 1.6 million views online. By applying machine learning to this data we are able to generate insights for our customers on how they can improve their communications efforts, become more relevant for their audience and improve their reach. At Mynewsday, I will highlight a few cases of how customers have been successful, give some concrete tips and talk about some of the products we now are launching to improve the life and work of communicators. Mynewsdesk acquired Mention earlier this year, what is Mention and what do they do? – Yes, It was very exciting to welcome 60 new colleagues to the Mynewsdesk family from Paris and New York earlier this year. Mention is a web and social listening service which allows you to monitor every conversation about your brand online. It allows you as a communicator to have the best listening capability for your brand in terms of volume, sentiment and channel across over 1 billion sources. Monitor your industry, your competition and yourself and get amazing insights to shape your current and future strategy. We have recently added all Nordic sources into Mention which makes it an incredibly powerful tool for our Norwegian customers. At Mynewsday, we will take a look at how some of our Norwegian customers are using Mention and improving their marketing whilst doing it. There may also be a special offer for those at the events. What do you think this year's participants can learn from you? – I often get the comment from customers "I never realised Mynewsdesk did that ... this is really amazing ... why don't you talk more about this?" 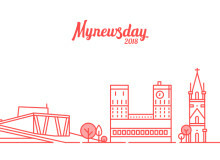 My goal is that after this Mynewsday everybody will be inspired to improve the communication and will know how Mynewsdesk can possibly help with this task. Hopefully we will achieve this by highlighting data, giving concrete tips and tricks from those that have succeeded and showcasing our latest products that are powered by the data and the machine learning that Mynewsdesk has developed. Du kan sikre deg billetter til Mynewsday ved å klikke på banneret nedenfor. Der ser du også resten av programmet og de øvrige foredragsholderne.